Skip the expensive infotainment system. An Android phone and a few accessories will do just fine. Android Auto will work in any car, even an older car. All you need is the right accessories—and a smartphone running Android 5.0 (Lollipop) or higher (Android 6.0 is better), with a decent-sized screen. Add a few handy apps and phone settings, and you can make your smartphone version of Android Auto just about as good as the dashboard version. Android Auto wasn’t always this easy. When it debuted in 2015, you needed either a new car or pricey aftermarket hardware to run Google’s infotainment system of the future. 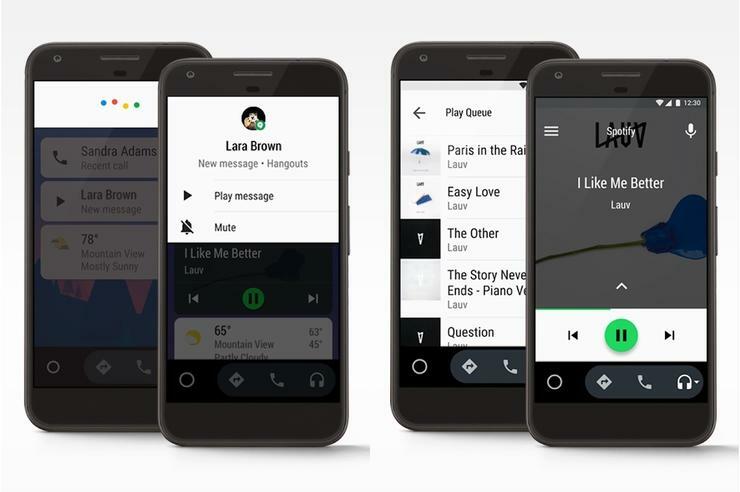 Google brought a standalone Android Auto app to smartphones the following year, allowing anyone with an Android phone to use the simplified menu system for music, navigation, phone calls, and messages. More recently, Android Auto added support for Google Assistant and all the same voice commands you’d use with a Google Home speaker. Read on for the best way to bring Android Auto to your car. Once you’re up and running, check out Google’s Android Auto Help page for even more information. Using Android Auto on your phone makes sense only if you can glance at the screen without losing sight of the road. 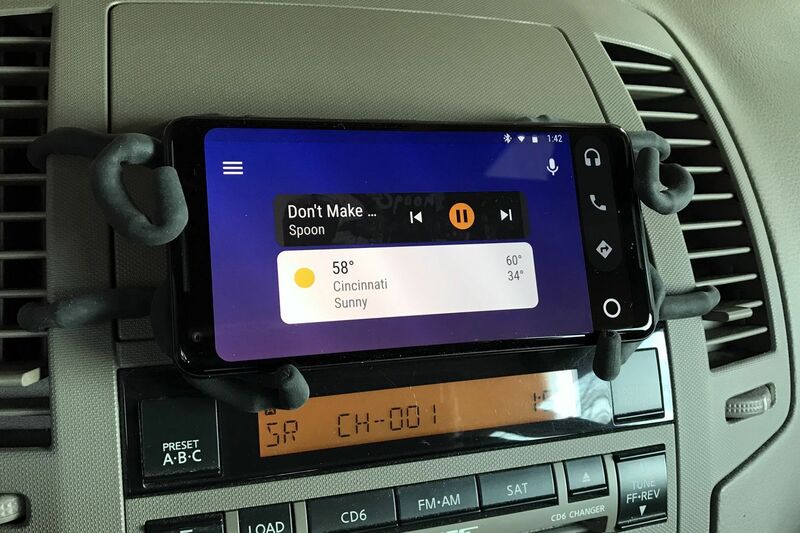 Car mounts for this purpose cost around $20, and can attach to your phone’s dashboard, windshield, CD player, or air vent. Check out PCWorld’s car mount guide for recommendations. In my case, I used an old Breffo Spiderpodium Tablet (currently $16.95 on Amazon), whose bendable arms fit snugly into my Nissan Altima’s air vents. The remaining four arms cradle my Pixel 2 XL securely when it’s inserted from above. Mounting your phone in landscape mode almost makes it seem like an in-car infotainment system. Unless your phone needs charging, you shouldn’t have to mess around with cables every time you get in the car. Connecting your car to Bluetooth removes the extra bit of friction that might stop you from listening to music or asking for directions. If your car already has Bluetooth built-in, you’re in great shape. Just pair your phone through the car’s infotainment system, and proceed to the next step. Otherwise, you’ll need some extra hardware to add Bluetooth to your car. This $18 receiver adds Bluetooth to any car with auxiliary input. These receivers have built-in batteries, but you’re better off keeping them connected to a car charger. RAVPower’s tiny dual-USB car charger costs just $8 on Amazon, and it allows you to charge the Bluetooth receiver via any micro-USB cable. Use the second slot to charge your phone on long trips. Don’t have auxiliary input? You can still use a Bluetooth FM transmitter, which grabs audio from your phone and creates a short-range broadcast for your car radio. The most popular pick on Amazon is the Bluetooth Transmitter from VicTsing ($18 on Amazon), which has a dial for quickly selecting an open radio frequency. The car charger also has a spare USB slot in case your phone needs a boost. 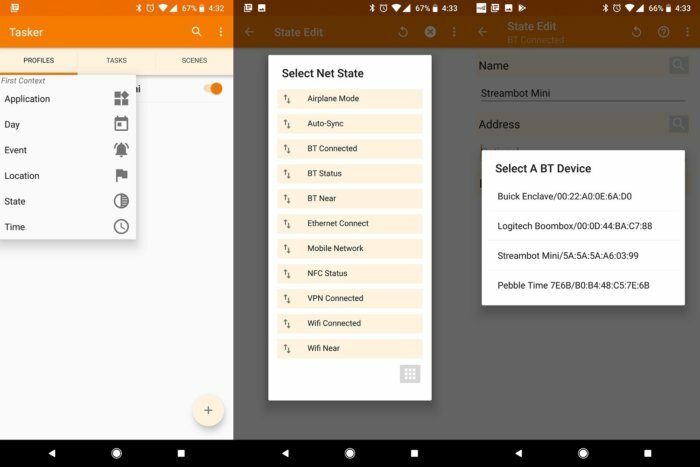 Once you’ve got a Bluetooth solution and paired it to your smartphone, install the Android Auto app from the Google Play Store. But don’t stop here! The real magic happens when you create a rule to launch Android Auto when it connects to the car via Bluetooth. 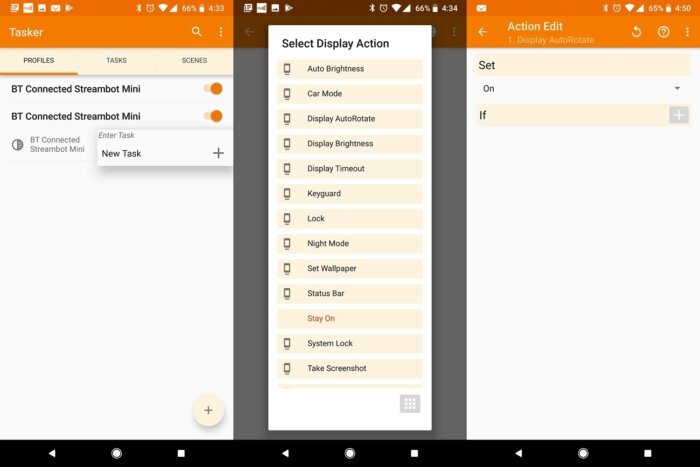 Launch the Android Auto app, then press the menu button in the top-left corner and select Settings. Scroll down and select Autolaunch, then flip on the toggles for Autolaunch and your car’s Bluetooth connection. You may also turn on pocket detection so the app doesn’t launch prematurely. Under Profiles, press +, then press State, then select Net, then select BT Connected. Under Name, press the magnifying glass, then select the name of your car’s Bluetooth device. Under Address, press the magnifying glass, then choose your car’s Bluetooth device again. On the Task Edit screen, press +, then press Display. Next, select Display AutoRotate, then select On from the Set menu. Hit the back button in the top-left corner, then press the back button again on the next screen. Your phone will now automatically disable rotation lock when it’s connected to the car. When the connection terminates, it’ll return to portrait-only mode and exit the Android Auto app. Finally, you can prevent the phone from feeding audio to the car at low volumes with the free Bluetooth Volume Control app. After downloading the app, add your car’s Bluetooth with the “+” button, and set the volume to 100%. Android Auto is essentially a special version of the Android interface, with larger buttons, simplified menu items, and fewer distractions. 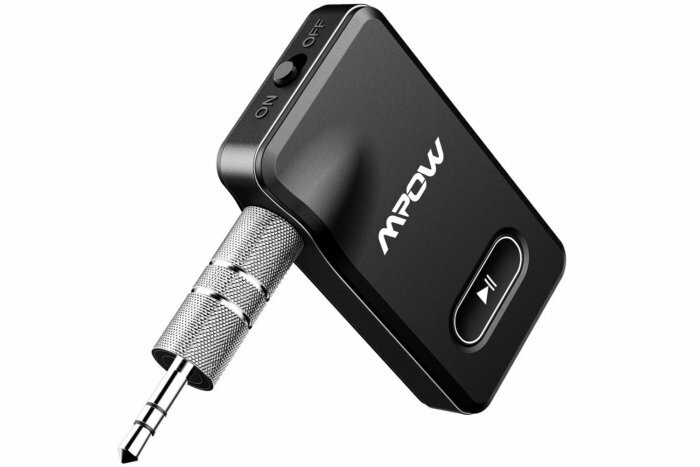 The headphone icon provides quick access to compatible music apps such as Pandora and Spotify, the navigation icon provides directions from Google Maps (or Waze, if you’ve installed it), and the phone button lets you place calls. In many cases, though, it’s easier to use voice commands. Hit the microphone icon or say “Hey Google,” then ask for music, directions, a phone call, or a text message. This works with all Google Assistant actions, so you can even dictate to-do list items, add calendar appointments, and turn down the thermostat at home. 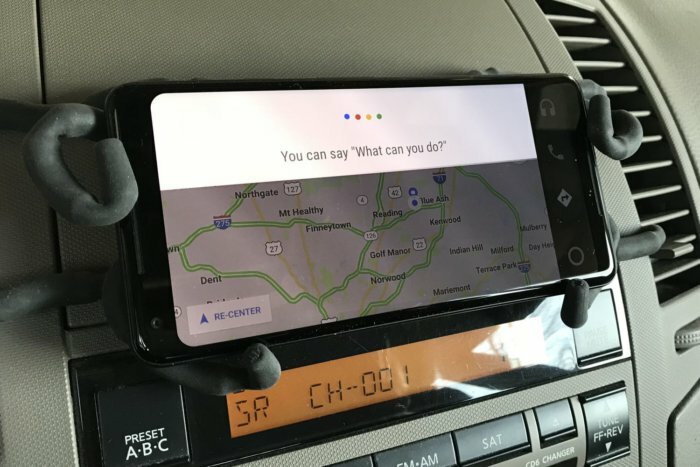 Music, directions, and calls are just a “Hey Google” voice command away. When you’re finished driving, Android Auto should recognize that the Bluetooth connection has terminated and will exit the app automatically. But if not, tap the circle icon, then press Exit to return to your regular phone interface. Finally, don’t forget to take your phone with you!